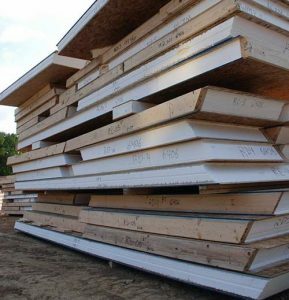 Let’s start by defining what an Insulspan® Structural Insulated Panel is. 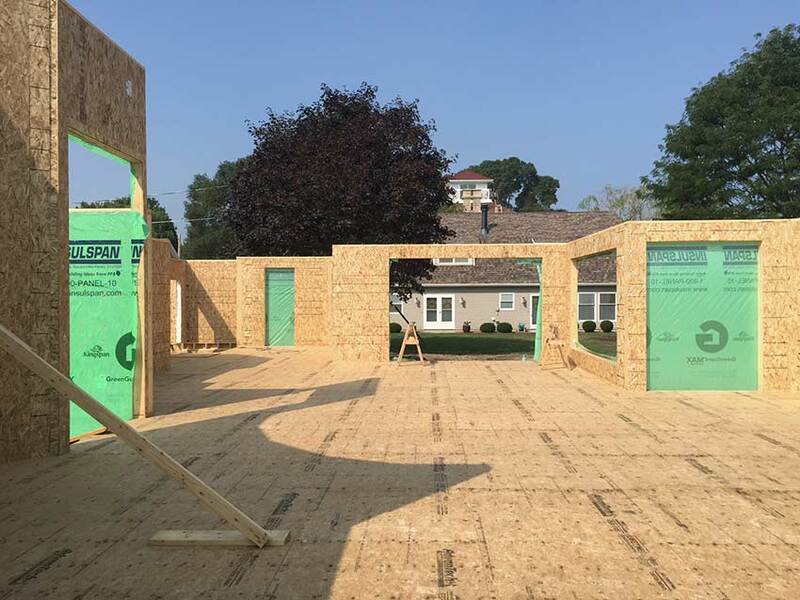 Insulspan SIPs are made from two sheets of performance-rated oriented strand board (OSB) that are structurally laminated to either side of a continuous core of expanded polystyrene (EPS) insulation. It is important to note that not all SIPs are produced using the same materials or even using the same methods. Learn more about all of the technical advantages of our SIPs. What are the benefits of choosing to build an energy efficient SIP home? There are many, but some of the highlights include: a lower cost to heat and cool your home, increased comfort levels, healthier interiors, and knowing that you are doing your part to reduce energy consumption. Did you know, according to the U.S. Department of Energy, heating and cooling accounts for about 40% of your total energy costs per year? The best way to reduce your energy consumption is to reduce energy loss. This is where Insulspan SIP panels have the greatest influence. SIP homes provide improved resistance to the energy lost through air leaks and thermal transfer. For example, when your interior air remains at more consistent temperatures, your heating and cooling systems do not have to work as hard. This means, while your energy bills will not disappear, you will notice a dramatic reduction in the cost to heat and cool your new home. Visit our Superior Energy Efficiency page to learn more about how Insulspan SIPs reduce energy loss. Looking to remove energy costs all-together? Check out how SIPs help you get to net-zero. Most of us living in traditional homes have learned to deal with rooms getting too hot, and then too cold– as well as spaces that feel colder in one spot than they do in another. If you hate drafts and get tired of taking your sweater off and on, then get ready to smile. The tightness of an Insulspan SIP home helps keep cold air from entering your warm spaces and causing drafts. Many homeowners who choose to build an energy-efficient SIP home for the energy cost savings, spend more time talking about how amazingly comfortable their new home feels when compared to past homes. Learn more about the health and comfort benefits of SIP homes. Choosing a home constructed with Insulspan SIPs is a great way to build green, or sustainably. For one thing, prefabricated SIP homes reduce waste during construction. SIP homes also consistently reduce energy consumption through the life of the home. Finally, these homes tend to remain in use longer than conventionally built ones. This is important because all homes consume resources in order to be built. So, the longer a home remains a viable living space, the more sustainable the building materials are. A home built with foam? How can it be structurally sound? The truth is the lamination of the SIP panels creates an incredibly strong structure. The SIP structures have engineering values exceeding those of traditional stick frame construction. Insulspan SIP homes have withstood all kinds of environments, from seismic zones in California to hurricane winds in Florida, and high snow loads in the Rocky Mountains. You can also use the structural features of a SIP home to create more open interior spaces, without adding extra posts or interior walls. Learn more about our SIPs structural superiority. Who Will Design Your SIP Home? Structural insulated panels are drawn into all kinds of designs. Insulspan has a team of dedicated production designers who have worked with plans from architects, designers, and even pre-purchased floor plans. We determine how the panels will fit with your design and then produce the panels to fit your exact needs. If you have not yet found a plan, we invite you to review our SIP-Certified Architectural Designers. Who Will Build Your SIP Home? Building a SIP home is different from the typical 2″ x 6″ stick frame construction. However, most first-time builders express surprise at just how easy it is. Part of that ease comes from Insulspan’s years of experience. We provide builders with detailed construction documents, offer on-site technical assistance, and provide builders the opportunity to attend one of our Insulspan Universities for hands-on training. We also have relationships with a number of experienced SIP home builders throughout North America. Make sure to ask us if we know someone in your area.